Dont be fooled by the small size of the Konica Minolta PagePro 4650EN. This rugged and robust monochrome laser printer comes with built-in networking connectivity and offers a monthly duty cycle of 150,000 pages. Print speed is quick and it has a maximum resolution of 1,200 x 1,200 dpi. 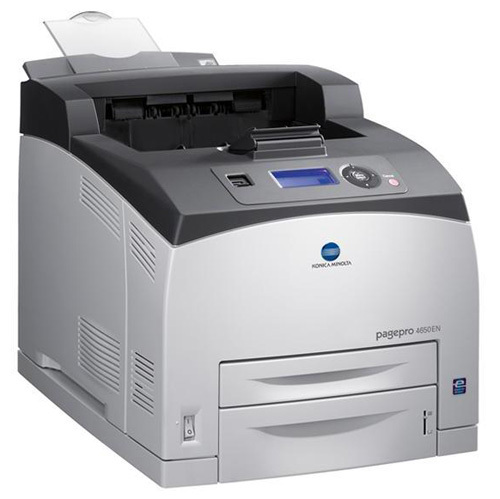 The Konica Minolta PagePro 4650EN black and white laser printer is integrated with 128 MB of memory that can be expanded to 384 MB and it has a 500 MHz processor. Wi-Fi is not offered by the Konica Minolta 4650EN printer. This model measures 404 x 222 x 465 mm and weighs 21 kg. The PagePro 4650EN printer has a small back-lit monochrome LCD display and navigation buttons on its control panel plus a USB host. For connectivity, USB, Ethernet, and parallel interfaces are available. The Konica PagePro 4650EN workgroup printer has a standard paper handling capacity of 700 sheets but it can be upgraded to 1,800 sheets. Print speed can go as fast as 35.7 ppm with the first page out in 8.8 seconds. Users dont have to wait long to get their output from the fast PagePro 4650EN workgroup laser printer. The 4650EN mono printer delivers high-quality output too. It is very reliable and easy to use and setup. Workgroups can easily share the Konica Minolta PagePro 4650EN monochrome laser printer as it has Ethernet and is compatible with Macintosh, Linux, and Windows operating systems. A USB host is offered for direct printing from thumb drives. A choice of standard or high capacity cartridges is offered for the PagePro 4650EN to suit the varying needs of offices and workgroups. The automatic duplexer for double-sided printing must be bought separately while Wi-Fi is not offered, even as an option. The Minolta PagePro 4650EN's control panel needs improvement.